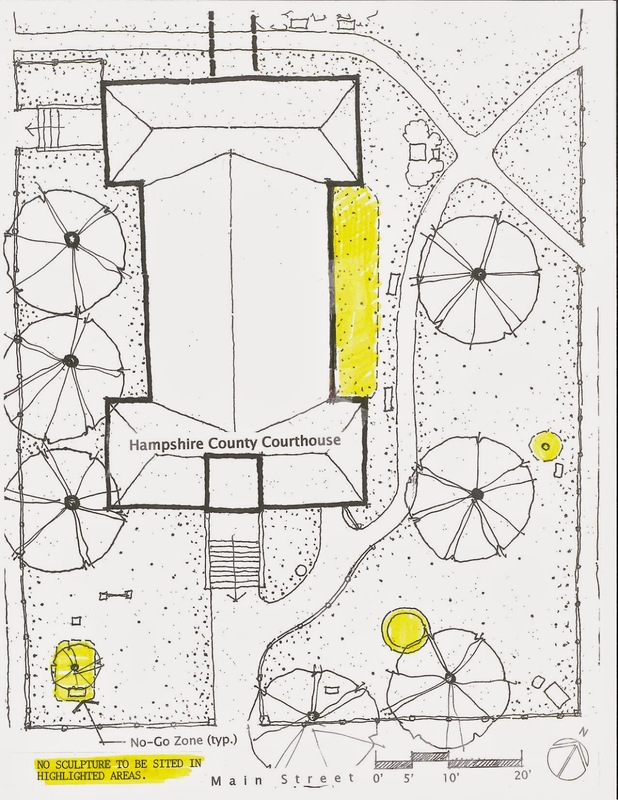 The Hampshire Council of Governments (Council) is accepting proposals from Hampshire County artists for the permanent placement of a work of sculpture on the Old Courthouse site, 99 Main Street, Northampton. The Council is seeking an innovative, thought provoking sculpture. The sculpture must be of durable material and fabrication. The cost of the piece, including fabrication and installation, is not to exceed $35,000. The artist will be responsible for the total costs associated with the creation, fabrication and installation of the piece. After installation, the piece shall become the property of the Hampshire Council of Governments. Suitability to the proposed site, both building and grounds. The public safety and durability of the artwork. The Council does not provide workers’ compensation or disability insurance. Depending on the nature and scale of the selected piece, the artist may be responsible for liability insurance during installation. A written description of proposed artwork, including, but not limited to, the medium, dimensions (height x width x depth and weight), installation method, anchoring procedure, and any necessary maintenance to be provided. If the artist’s proposal is selected, then the artist shall present plans sufficient to have installation approved by a structural engineer. If the work of art already exists, up to 5 photographs of the artwork, including reference to human and site scale. If it is a proposed new work of art, working drawings and/or up to 5 photos of the maquette constructed to scale. Artist’s resume showing home and/or studio address (must be a Hampshire County-based artist). A site plan along with up to 3 illustrations showing the proposed location and orientation of the artwork in relation to the building and grounds, existing trees, and other site features. Up to ten digital images of previously completed work. All images must be submitted in JPEG format. The images must be 1920 pixels on the largest side (vertical or horizontal) at a resolution of 72 ppi. Image files should be saved to a CD (readable by Mac or PC) along with a checklist. The checklist must indicate the artist's name as well as the title, date of completion, media, and dimensions of each piece. A jury will review the submittals and recommend a piece to the Hampshire Council of Governments Board of Councilors for final awarding. The Council reserves the right to reject any and all proposals. Consultations may be scheduled with finalists at the sole discretion of the Council. All proposals shall be submitted to the Public Art Jury, c/o Administrative Office, Hampshire Council of Governments, 99 Main Street, Northampton, MA, 01060, no later than 3:00 PM on May 15, 2015.